Today's centering exercise is about GRATITUDE. The definition of thankfulness, gratefulness, or appreciation is a feeling or attitude in acknowledgment of a benefit that one has received or will receive. Gratitude can be for big events or awards. Gratitude can be for small things like a child's smile or a beautiful day. Gratitude can be for things unseen like your breath. Gratitude reminds you of all the goodness in your life. Finding gratitude reduces stress and brings you into balance. Name 5 things that you are grateful for in your life? 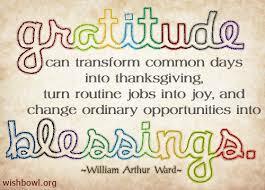 Name 5 things that you are grateful for today?